I was visiting VC in her London pad earlier this week and her flatmate had a Japanese friend staying over. Somehow the conversation turned to food – as it inevitably does when I’m in the room – and they were talking about the cupcakes they ate on one of their trips to Japan. There was talk of Oreo cupcakes and I was intrigued. I like Oreos. I like cupcakes. My eyes glazed over and became vacant at the thought. What could be finer? VC’s flatmate was kind enough to dig out the recipe she spoke of and explained in hushed tones the deliciousness of the ganache frosting. I looked over the recipe, it seemed easy enough, but it contained rice flour – interesting. The ganache frosting was so simple, some melted chocolate mixed into whipped cream. I licked my lips at the thought. OK, so here’s how it worked out for me. I couldn’t find any rice flour so I used cornflour – ‘Google’ said it was acceptable. 🙂 But I knew it wouldn’t be the same because rice flour has a granular texture that I quite like. I’ll keep looking. As much as I loved the sound of that ganache, I felt it might too rich for my boys, so I chose the white butter frosting instead. I had visions of crumbled Oreo sprinkled over the top of puffy white mounds of frosting and thanks to the box of 20 piping nozzles Mum gave me for Christmas, I was up to the task. Cream butter till white and add sugar. Beat again till fluffy and add eggs one at a time. Alternate the flour mixture and milk in two additions. Spoon into cupcake liners and bake till golden and cooked. To make the white frosting, beat about 50g of softened butter till it’s white. Add about 2 cups of icing sugar – slowly – so you don’t end up with a kitchen covered in a film of icing sugar as I always do. Add some vanilla and a couple of spoonfuls of milk to make it the consistency you desire. To make the ganache, break up 100g of chocolate and melt (slowly, on low heat) in the microwave with 2 tbls of cream. Whip up the rest of the cream, from a 250ml carton. Fold in the melted chocolate. After researching some recipes I got some interesting tips. Some people like the biscuit broken into large chunky pieces, some like them blasted to smithereens, some place a half an Oreo on the bottom of the cupcake liner. So play around and make it to your taste. To make the Oreo dust, break the tops of about 6 biscuits and keep the pieces WITHOUT the cream, that way you have a nice dry texture. To smash the Oreos, I used a zip lock back (a big one) with the air squashed out. I then got a meat hammer or you could use a rolling pin and I smashed the hell out of it. Use a chopping board underneath – especially if you have nice bench tops or you could end up with some nasty dents in it. Trust me. I have done this before. 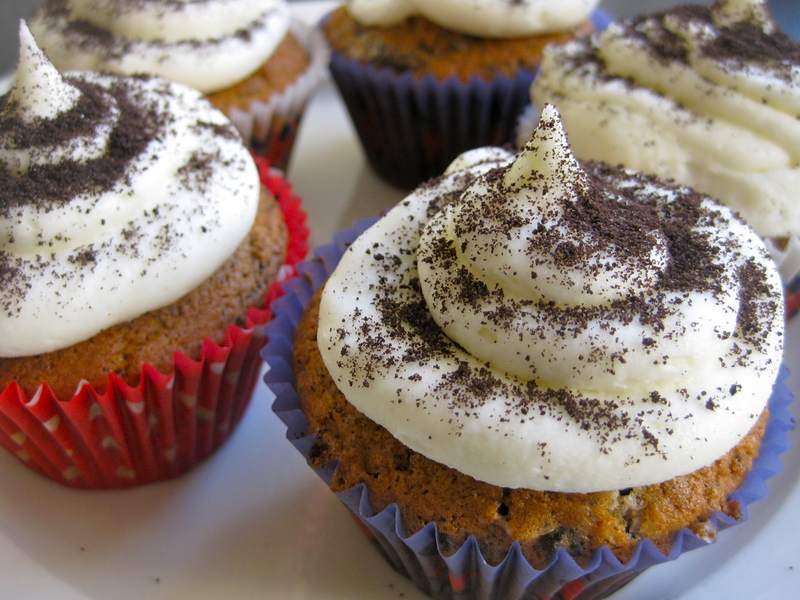 Now go forth and make your own Oreo cupcakes. Thanks flatmate ‘A’ for the recipe! I Am Going To have to visit again whenever my course load lets up – nonetheless I am taking your Feed so i could go through your blog offline. Thanks.